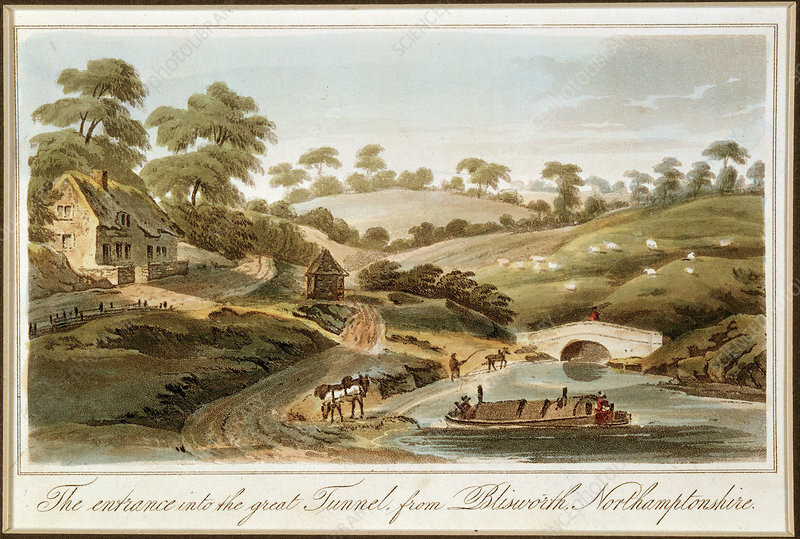 Entrance to Blisworth Tunnel, Grand Junction Canal, Northamptonshire, 1819. A Boat approaching the entrance to the great tunnel from the Blisworth end. The 3056 yard long tunnel did not contain towpaths, so the horses which towed the barges had to be taken around the hill. Meanwhile the method by which the boats travelled through the tunnel involved men lying on their backs and pushing against the walls or ceiling of the tunnel. By this method, known as 'legging', it could take 2 to 3 hours to move a boat through to the other side. In 1871 the job was taken over by steam tugs. The Grand Junction Canal was part of the network linking London with the Midlands manufacturing towns, and with Liverpool. The canal was built between 1793 and 1805, with William Jessop as its chief engineer, and James Barnes as resident engineer responsible for most of the day to day construction. From Tour of the Grand Junction by J Hassell, 1819. Artist: John Hassell.